In a custom-built watch safe, your most valuable timepieces are not only safe from unauthorized access, but also securely protected against environmental influences. Down to the smallest detail, exterior and interior are designed and built entirely to your wishes and requirements, in the materials and colours of your choice – the exclusive look of the safe does full justice to its valuable contents. A HARTMANN watch safe is more than just a secure storage space – it is a symbol of your good taste, reflecting a long tradition of superb craftsmanship. Have your watch safe fitted with the desired number of watch winders of your choice. They can also be fitted as a removable module. Watch winders ensure that your self-winding watches remain fully functional and ready to display at all times, even during storage in the safe. Time and date settings are always correct. This is especially important if you like to wear different watches from your collection to suit the occasion. If you have special models, such as aviator watches that display the phases of the moon, or vintage watches with a perpetual calendar, a watch winder is particularly useful. A watch winder is also an effective means of preventing the oil in self-winding watches from becoming resinous. Besides, watch winders are regarded as a particularly stylish setting to store watches, as they allow a watch to be displayed to full advantage. The choice of watch winders depends on the composition of your watch collection; the number of winders needs to correspond with the type of watches you own and the size of your safe you have chosen. 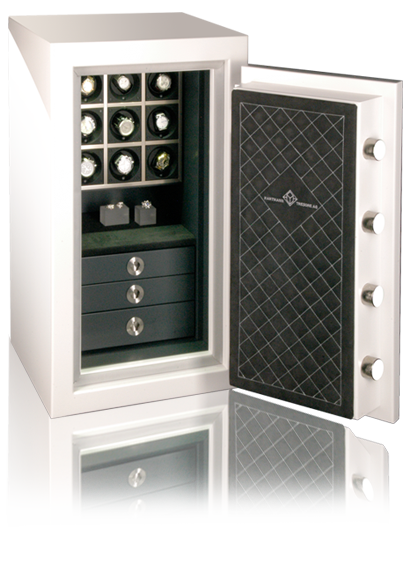 We adapt the interior of the safe to suit your watch winder requirements. Large, heavy watches require powerful winders, and it must be possible to change the setting of the winders according to the watch model; watch winders must also be able to move at different speeds and in different directions. Drawers with specially equipped interiors provide space for more watches or other items of jewellery. Every drawer in your watch safe is constructed – usually from finest hardwood – entirely to your requirements, down to the smallest detail. It is left to your own personal taste to decide whether walnut, oak, maple, wenge or another type of wood is used. The drawers can be lined with velvet, Alcantara or leather in any colour you care to choose. The drawers of your safe can be fitted with watch cushions or watch compartments if you wish, but also with special compartments for storing other jewellery, such as rings, necklaces or bracelets. Of course, delicate glass shelves can also grace the interior, and LED lighting will display your valuables to the best possible effect. Your individual wishes also determine the exterior colour scheme – whether you prefer a distinguished, high-gloss black finish, elegant white, a unique shade of gold, or even Ferrari red, Lamborghini orange or a subtle rosé. Naturally, your watch safe also offers plenty of secure storage space for other items of value besides watches and jewellery, such as important documents, certificates etc. You can also choose the form and finish of the handles and fittings. Gold, nickel or platinum plating – the choice is yours! Beauty and security go hand in glove! One thing you don’t need to worry about with your watch safe is security. We offer you more than just a safe, we provide a complete security package and work closely with you to ensure your watch safe is integrated in the security systems of your home. HARTMANN safes are tested and certified to European standard EN 1143-1 and available in all burglary protection categories. The value of your watch collection decides which security level is the right one for your watch safe. You can rely on us for comprehensive, discreet advice to give your valuable collection the best possible protection! There are plenty of lock options to choose from, too. Contact us for advice on which locking system is appropriate for your watch safe. An electronic locking system or innovative fingerprint locking system offer you a decisive advantage over a classic double-bit lock: where there is no key, there is no need to worry about where to keep it safe. Your watch safe can also be fitted with burglar alarm system components, if required. Connecting your safe to a VdS-approved burglar alarm system raises your insurance cover further. Who could ask for more security? Our expert staff will, of course, also take care of the professional delivery, installation and anchoring of your watch safe at its chosen location. Here, too, you can rely completely on our all-round service. As part of our after-sales service, we will be glad to answer any questions about your safe long after you have purchased it. HARTMANN TRESORE AG is one of the largest suppliers of quality safes in Germany, Europa and the Middle East. On the solid basis of around 150 years of experience in the locksmith’s craft, the company began to specialise in the production of safes in 1983. The brand “Signature Safes by HARTMANN” is top of the range; these are safes developed especially for connoisseurs and collectors of watches and jewellery, offering absolutely unique, individual design to match both your collection and your personality. What will your uniquely personal watch safe look like? How will it be equipped? Should it be the focal point of a specific room? Or do you not have a clear idea of your safe yet? Do you have concrete plans to enlarge your collection in the near future? Whatever the case, we will be delighted to advise you and clarify all open issues to ensure that your safe is exactly right for your present or future collection – your uniquely personal watch safe! Give your valuable collection the best possible protection – in a custom-built safe providing certified security and designed exclusively to your specifications and requirements. A distinctive item that expresses your unique style! What will your uniquely personal watch safe look like? How will it be equipped? Perhaps our gallery will give you some inspiration. We will be glad to advise you individually and work together on the design for your Signature Safe. Let us convince you that there is more to a safe than its technical definition. From the exterior paintwork to the smallest interior detail – we will design your watch safe according to your wishes and requirements! You can rely on HARTMANN quality! Our watch safes have been tested and certified by impartial institutions in accordance with valid European standards. Security is our top priority! With the desired number of watch winders of your choice and specially equipped drawers. Optimum protection for your collection! For questions, enquiries or suggestions, please don't hesitate to use our contact form or call us directly! We look forward to your feedback and will respond to your request as quickly as possible. HARTMANN TRESORE Polska Sp. z o. o. All information and statements on these websites are non-binding. HARTMANN TRESORE AG reserves the right not to be responsible for the correctness and completeness of the contents. No guarantee is accepted and no assurance of product characteristics made. No legal claims can be derived from the contents of the websites. Errors in contents will be immediately corrected upon knowledge. The contents of the websites may not be continuously topical caused by delayed updating. Please do not hesitate to ask us for current state, technical details and availability of products. Links to other websites are not continuously monitored. Therefore, we do not accept any responsibility for the contents of linked pages. HARTMANN TRESORE AG does not accept any liability for the correctness of data and software as provided for downloading from the websites. The software is checked by HARTMANN TRESORE AG for virus attacks. Nevertheless, we recommend to scan data and software after downloading using the latest virus scan software. The contents of these websites is protected by copyright. A copy of the information on the websites may be saved on a single computer for non-commercial and personal internal use. Graphics, texts, logos, pictures and so on may be downloaded, duplicated, copied, modified, published, sent, transmitted or otherwise used only with the prior written approval of HARTMANN TRESORE AG. Product and company names mentioned may be registered trademarks or brands, unauthorized use of which may result in claims for damages and claims for an injunction. We cannot guarantee that information or personal data being transmitted to us are not “bugged” by third parties during transmission. HARTMANN TRESORE AG cannot be held responsible for damages, particularly consequential damages, direct or indirect, data loss, loss of earnings, system failures or loss of production originating in the use of these websites or the downloading of data. This exclusion of liability is not valid in case of intent or gross negligence. The legal relationship between you and HARTMANN TRESORE AG resulting from the use of the websites is subject to the Law of the Federal Republic of Germany. For any litigation with registered traders resulting from the use of these websites, legal domicile will be the headquarters of HARTMANN TRESORE AG at Paderborn. HARTMANN TRESORE AG wants to increase the confidence of the users in the Web and therefore discloses its handling of personal data. Below you will get to know which information is gathered and how it is dealt with. As a rule, you can call up all websites of HARTMANN TRESORE AG without giving your personal data. If, in individual cases, your name, address or any other personal data are needed, you will be reminded of that beforehand. Your personal user data are utilized to make the service provided for you by HARTMANN TRESORE AG as pleasing as possible and to improve this service. If you decide to leave personal data to HARTMANN TRESORE AG via the Internet to allow handling of correspondence or execution of orders, these data will be carefully handled in accordance with the strict regulations of the German Data Protection Law (BDSG). HARTMANN TRESORE AG saves your data on specially protected servers in Germany. Only a few persons, authorized by HARTMANN TRESORE AG, who are dealing with the technical, commercial or editorial handling of these servers, have access to these data. If you ask HARTMANN TRESORE AG not to use your personal data for further contacts and/or to cancel these data, we will proceed accordingly. Data being absolutely imperative for order processing and commercial purposes, respectively, are not concerned by any such notice or deletion. We hope you’ll understand that in case of revocation a personalized service cannot be given any more, since it is based on the use of customer data. The websites of HARTMANN TRESORE AG contain links to other websites, if applicable. HARTMANN TRESORE AG does not have any influence on the editorial contents of foreign websites. Moreover, it is beyond our control if the operators of foreign websites comply with the data protection regulations. As a rule, the websites of HARTMANN TRESORE AG do not contain advertising space. In the contradictory case, the advertising is delivered via external ad-servers. The data recorded in connection with online advertising (ad-impressions, ad-clicks) serve exclusively for statistical evaluation and generation of reporting to advertising customers. No personal data are used in this case. In the course of delivery of advertising possibly cookies are used, without HARTMANN TRESORE AG having any influence thereon.